This week I met another member of the band Plastic Castle. I now know half of the band! It was a pleasure to meet Andrew Aragon. He has amazing dreams that are totally achievable with his talent! Andrew is a junior at CSULB and is studying psychology. Apparently he hated everything else besides music and psychology so he decided to major in that. He finds it super interesting but wants to have a music related career. 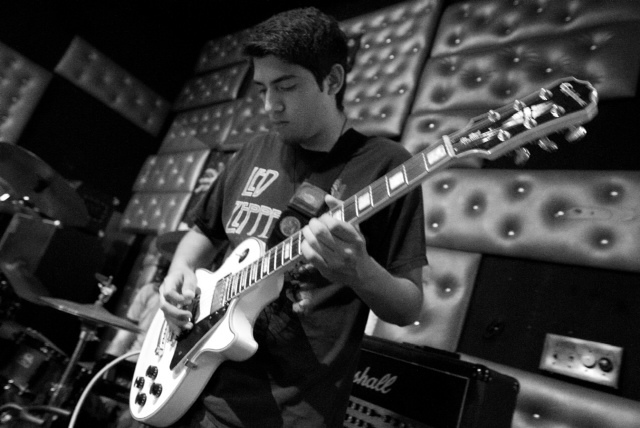 Andrew is very into sounds and playing with tones and pedals and is hoping to do something with sound engineering. Andrew is from San Pedro California and commutes to school everyday. He went to Bishop Montgomery high school which he enjoyed. He got to play in all the school bands and be a big part of the jazz band there. We bonded over our hometowns because we both come from places that have a lot of nature. We discussed how we love Long Beach and the vibes here, but miss nature from our hometowns. I want to take a trip there to see the beautiful ocean cliffs and open fields in San Pedro. So back to Plastic Castle, Andrew and his friend Anthony Diaz came together to start the band. Diaz already had some songs written so the band came together to create those at first. They have a show November 8th at Suzy’s in Hermosa Beach, so everyone better go! Andrew is very happy about their upcoming album that should be coming out soon. It was awesome getting to talk to Andrew and hear about another art form that is so closely tied to dance. His passion for music was inspiring. We were talking about maybe doing a collaboration together which would be awesome. Posted in Andrew Aragon, Art110, CSULB, Plastic CastleBookmark the permalink.